We here at FYM love and appreciate very dearly the hardworking publicists and managers of bands that allow us to get 'on the list' of many of their client's concerts, but sometimes it also helps to just have some personal connections of your own apart from that. Working at the Hollywood Bowl for three years right out of high school will do just that, especially if you still know several people who still are employed at the legendary venue. So, FYM was on the list for The Chemical Brothers, Chromeo, and YACHT on Sunday night, but in a slightly different manner than usual. This time it involved bringing to the venue a Thank You basket of goodies for the person who got us in. Anyway, every Sunday throughout the summer the Hollywood Bowl hosts 89.9 KCRW's World Festival: a series of concerts featuring music from prime artists all over the world (this year featured such acts as Jamaica's Jimmy Cliff and Cuba's Orquesta Buena Vista Social Club). The show is popular with people of all ages and backgrounds, which includes many middle-upper class retirees or close-to-retirees. So, every year when KCRW hosts its electronica night of the World Festival, it's always intriguing to see how these old folks react to their immediate environment suddenly becoming a rave. 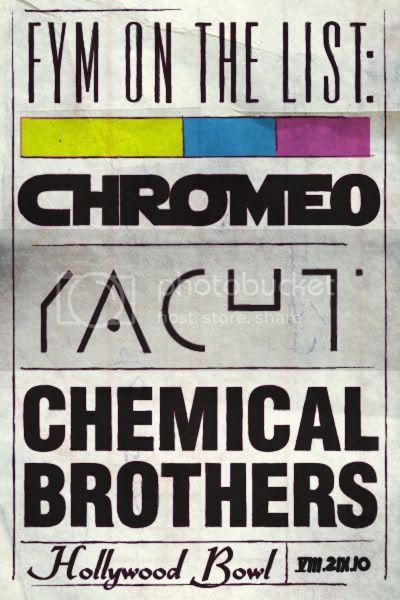 The reaction is usually "get me out of this God-forsaken place" but with a lineup that also included the very friendly to the eyes and ears Chromeo and YACHT, perhaps things would be different this time. Portland, Oregon's best dance crew YACHT kicked off the show right at 7:00pm, when the sun was still out. YACHT always brings a ton of energy to the stage and to the crowd. The fact that YACHT brought ANY energy to the Hollywood Bowl at all is a sort of miracle, as the group had just come off back to back to back nights of performances. Doesn't really sound all that tough for a touring band, right? Well, it sounds extremely tough when you realize those previous shows took place on consecutive nights in Copenhagen, Malmo, and Stockholm, Sweden. Defying the laws of jet lag, YACHT pounded the stage made it their own dance party for anyone who showed up early enough to see them. Frontman extraordinaire Jona Bechtolt was very thankful to be playing such an historic venue, rallied the crowed during sing-a-longs several times, and paid tribute to the end of summer before breaking into "Summer Song" from YACHT's 2009 album See Mystery Lights. Upon completion of set-closing "Psychic City (Voodoo City)", YACHT headed back home to Portland with promises of recording a new album for DFA Records. By the time Chromeo hit the stage, the sun was long set and the duo's trademark glowing lady legs keyboard stands were illuminated on the stage. From the nosebleed seats they probably looked like a pair of little lights on the stage, but the unsuspecting old folks closer to the stage got a nice hint of what was to come. This FYM writer has only seen Chromeo live before at festivals and always during the daytime, so it was nice to see them at night for once, their natural habitat. Chromeo tore through what felt like a "greatest hits" setlist, which is really saying something seeing how their third album isn't even out yet (September 14!). New songs "Night By Night" and "Don't Turn the Lights On" fit in with their classic material seamlessly and everything works extremely well live. They were appropriately flanked by a few alluring female backup singers on most of their songs and their stage banter between songs won over any doubters of all ages (especially when Dave1 wished Michael Jackson a Happy Birthday). Twitter activity after the show in Los Angeles showed that many people had a new favorite band after Sunday night, which is very understandable seeing how they absolutely killed it. Not too many people noticed them because not too many people were heading up the aisles heading home early; not even the old folks, many of which managed to make it to the end of what they will probably tell their grandkids was a great "rave".